Walk in Chicken Coops and Runs can help make your life easy. Housing your chickens in a walk in coop makes it easier for both you and your hens to get in and out. Not only that – walk in chicken coops and runs have many other benefits, many of which improve the health of your chickens. We take a look at why you should consider this popular option for housing your pet chickens. A Walk-In Chicken Coop (or Walk in Chicken Run) is easy to clean. They have large opening doors allowing you to step inside without hassle, unlike smaller coops or runs that require you to contort your body like an acrobat in order to simply gain entry to the coop or run. Whilst on this subject, once inside you can also easily clean the area without feeling akward and squished or crawling on all fours. A Walk in Chicken Coop or Run is generally easier to maintain then a smaller style coop. Because it is easy for a human to access, it is easier to change your hens water, feed or bedding. It is also easier to do a full coop or run clean and scrub down as part of your regular routine, or if a hen has been sick. 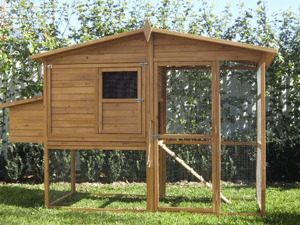 A Walk-In chicken coop is generally larger than a traditional pet chicken coop, providing more space to frolic. Not only are walk in coops generally larger, these style of coops and runs are much taller, meaning that there is more vertical space for your hens to feel more at home to carry out their normal behaviours such as walking, flying, hiding, stretching and perching. This style of chicken coop/Walk In run provides ample space for your flock to shelter, and escape from extreme weather conditions when it is positioned appropriately. 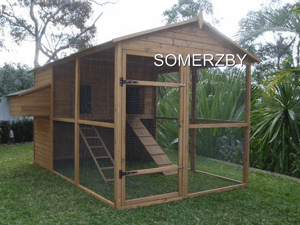 For example, a larger walk in style coop or run may be positioned so that, during different parts of the day it receives sun and/or shelter in different sections, which allows your chickens choose to sit based on the current weather. Also remember, predators may not just attack from the sides and bottom of your enclosure, birds etc may also attempt to attack your flock from above. The extra height in a walk in style coop or run helps your flock easily distance themselves from potential predators and not feel as threatened. A Walk in Run or Coop provides a secure place for your hens to sleep, play and nest in, providing protection from foxes, cats and dogs. 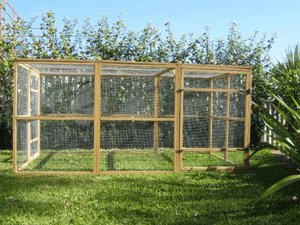 A walk-in chicken run provides your hens the freedom of space to roam freely, enjoying the sun and air flow, whilst still having protection from the elements and predators. Generally speaking, more space is better when it comes to your hens health. The RSPCA Australia states that chickens “should never be kept in confined or cramped conditions”. They also go on to recommend that the entrance to the enclosure should allow chickens to pass through easily, without having to crouch. A chicken who does not have to crouch or live in a cramped environment is likely to have a much better bill of health. A walk in chicken run or coop allows this freedom for your flock. In Australia we battle with many weather extremes, the most noted being the extreme heat we face through summer, and in some parts of Australia, we also have extreme humidity to contend with. Extreme heat and humidity are risk factors for heat stroke. Chickens can be easily affected by heat stroke. With a large area of screening, a walk in coop or run can help prevent heatstroke, as it improves ventilation and air flow within your chicken coop or run. Also, again it’s size allows you to easily provide your hens with shelter from the heat by positioning certain parts of it under shade such as trees and other shade structures. This entry was posted in Chickens and tagged benefits, chicken, Chicken Coop, chicken run, coop, in, run, walk, walkin.